Finding love and happiness where you least expect it. Welcome to my corner of cyberspace. 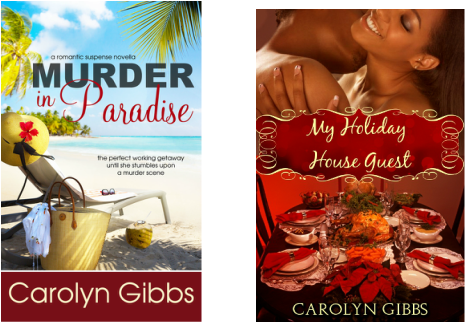 I'm Carolyn Gibbs, a recovering news junkie, former news writer and assignment editor, Real Estate Salesperson and women's fiction author. I've always loved telling and hearing stories, which is probably why I loved the news so much. I've always loved creative writing, and was hooked when a story I wrote in my creative writing class at C.W. Post College was published in the school's literary magazine, Loomings. I've also been published by True Confessions Magazine. My first novella Love and the Economy, was published by Secret Cravings Publishing, unfortunately my publisher closed their doors. Love and the Economy will be back on sale soon. My latest release, Murder in Paradise is a Romantic Suspense set in Hawaii. It is available on Amazon. So pour yourself a Mai Tai sit back and enjoy the action, adventure and romance when author Claire Jenkins comes across a murder scene while attending a writer's conference in Hawaii. My Holiday House Guest is a Thanksgiving themed romantic short story available on Amazon. Follow me on my blog carolynwrites.